This double action blank firing pistol fires 8mm blanks which although they contain no projectile, are useful in a variety of different ways. These blank pistols make for great dog training equipment and are also loud enough to be used as bird scarers. The magazine capacity of 7 rounds makes this blank firer incredibly versatile as does its semi automatic action. Based on the famous pistol used by secret agents and various armed forces round the world, this pistol really looks the part. 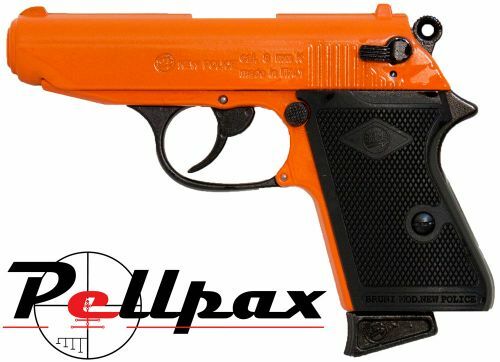 It is coloured bright orange to comply with UK firearms law.